You know those bananas that you keep avoiding in the fruit bowl? The ones which got a bit speckled a few days ago and now are fully fledged brown? Well, throw out your normal go-to recipe because my banana bread with chocolate, oats and honey is the way to go. 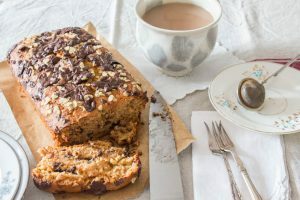 Adding a few extra ingredients gives it a delicious flavour and texture and I have been very much enjoying having a slice for breakfast each morning. Any excuse to start the day with chocolate. Grease and line a loaf tin and preheat the oven to 160C. Melt the butter and honey together in a small saucepan and stir to ensure they are well combined. Mash the bananas in a large bowl then pour in the butter and honey and crack in the eggs. Whisk everything together well. Sift the flour, sugar and baking powder into the banana mix and fold everything in gently. Stir in the oats and most of the chocolate chunks. Pour the mix into the prepared tin and then sprinkle the extra oats and leftover chocolate over the top. Bake for an hour, then check on the loaf to see if a skewer comes out clean when inserted in the middle. If not, keep baking and checking it every 5-10 minutes until fully baked. Leave the loaf to cool in the tin for a few minutes before removing and leaving to cool on a wire rack. 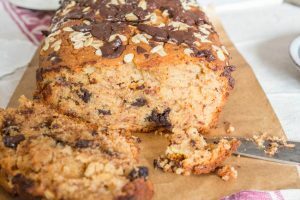 The oats on top of the banana bread have a lovely toasted flavour and the oats inside the bread swell up and have a deliciously chewy texture. 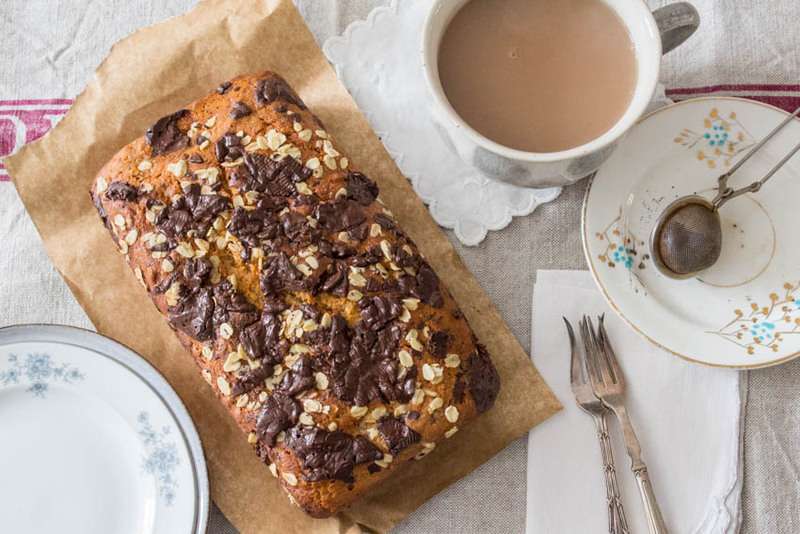 Who can resist a slice of warm banana bread? It’s even harder to resist when you know it’s covered in and is full of melted chocolate. Dark chocolate is definitely the best choice for this as it works so well with the sweetness from the bananas, sugar and honey. The honey gives the cake a beautiful mellow flavour and slight sticky texture. If your banana bread lasts a few days and you want to freshen it up, try lightly grilling or microwaving it and serving with plain yoghurt. Honestly one of the best breakfasts imaginable. Last weeks I baked quick bread mostly with pumpkins…time to do one with bananas! Yours looks fantastic! Banana bread with chocolate and oats sounds like the breakfast bread of the champions. We always have a few overripe bananas banging around in the freezer. A day to thaw and on to the cook. Thanks for this great and different banana bread recipe. Mmmm, sounds like good stuff! Fun twist on the traditional banana bread — thanks! I need no excuse to start the day with chocolate but if I did this would be perfect! Your loaf looks fantastic, banana bread is my kryptonite. Tell me about it, it doesn’t last long in our house! When I saw this yesterday while catching up on Instagram (after being in Sicily for almost a month), my mouth started watering. Banana bread with chocolate has to be one of my favorites! i delight when my bananas get overripe because it means banana bread is on the horizon! i like your addition of oats, both inside and on top!